Without a doubt, 5G has arrived and various key smartphone OEMs have already announced products that will support 5G cellular and connectivity. 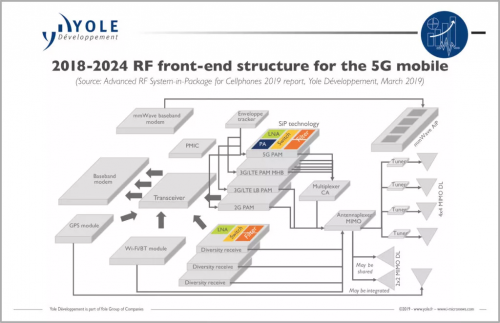 It is clear for everyone that 5G will totally redefine how the radio frequency (RF) front-end interacts in-between the network and the modem. The new RF bands (sub-6 GHz and mm-wave, as defined in 3GPP release 15) pose big challenges for the industry. The megatrends are today directly impacting the semiconductor and the advanced packaging industries and 5G is of course part of them. “5G will bring more packaging business for outsourced semiconductor and test service (OSATs) providers”, asserts Santosh Kumar, Principal Analyst and Director Packaging, Assembly & Substrates, Yole Korea. Yole Développement (Yole) and System Plus Consulting, pursue their investigation towards the advanced packaging world and especially highlight today the ones focused on RF applications for cellphones. Under the dynamic context related to the 5G revolution, the leading advanced packaging companies are strongly investing to propose impressive technologies: “From a technology viewpoint, base stations to smartphones, protocols to hardware, semiconductor devices and packaging, 5G requires disruptive innovations and not incremental ones as it was mostly the case in the past,” explains Santosh Kumar from Yole. This month, both partners release three dedicated reports dedicated to the RF system-in-package (SiP) technologies. With both analyses, Yole and System Plus Consulting would like to give a broad understanding of the industry evolution, the innovative technologies and the strategy of each players. The “Advanced RF System-in-Package for Cellphones” is a comprehensive review of the SiP market for various RF front-end modules in the mobile business. 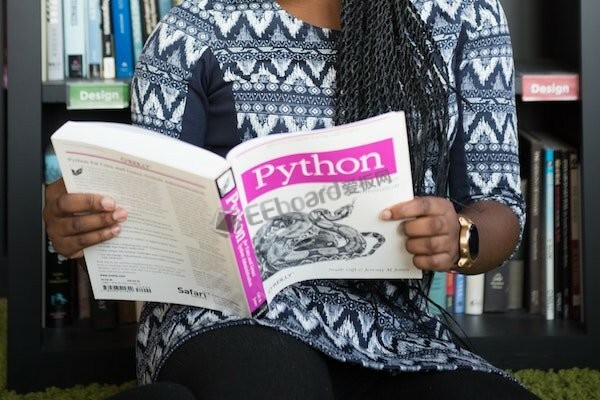 Market figures, technology trends, competitive landscape and more are part of this analysis. 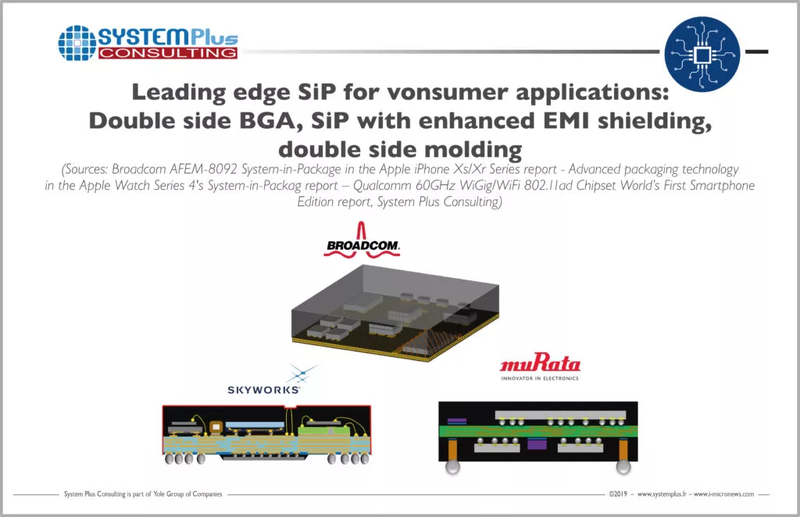 In addition, System Plus Consulting proposes two case studies to point out the technology choices made by the leading players and the benefits of each of them, with: “Broadcom AFEM-8092 System-in-Package in the Apple iPhone Xs/Xr Series” and “The advanced packaging technology in the Apple Watch Series 4’s System-in-Package”. Based on a real synergy between their expertise, the companies offer an exhaustive comprehension of SiP solutions for RF applications. Typical RF front-end components in smartphones include various switches, filters, amplifiers and the antennas themselves. More and more, SiP technology is selected by leading companies to answer to the market needs such as the implementation of an increasing number of bands and the development of circuitry in ever smaller surfaces. 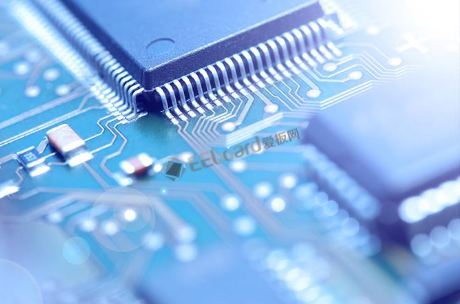 Therefore its added-value is its ability to gather many ICs, package assembly and test technologies on the same surface. In the end, companies create highly integrated products with optimized cost, size, and performance. The 2nd-level SiP packaging, which is performed at the SMT level: under this segment, various components are assembled on a SiP substrate along with passives. In 2018, the total RF front-end module SiP market (including 1st and 2nd levels) was US$3.3 billion. Five years later, in 2023, it is expected to grow at an 11.3% CAGR, reaching US$5.3 billion. 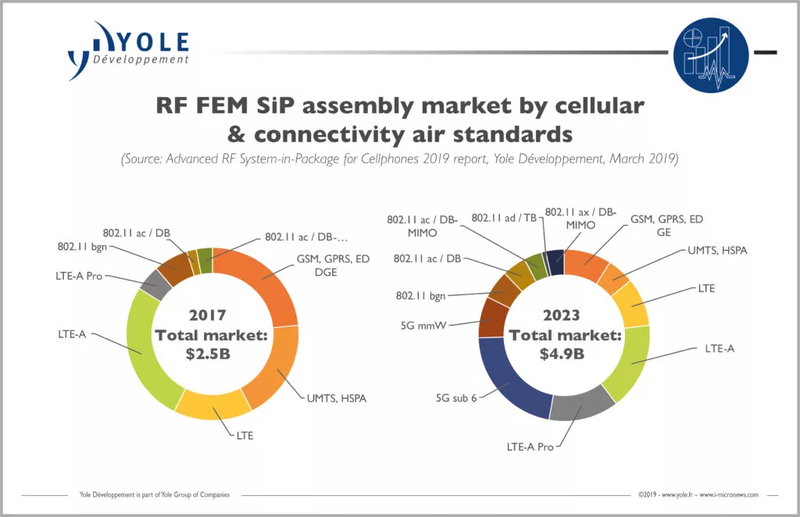 By 2023, the RF front-end SiP market for cellular and connectivity will constitute 82% and 18% of the total SiP market, respectively. By cellular air standards, front-end modules supporting 5G (Sub-6GHz and mmWave) will account for 28% of the total RF SiP market in 2023. High-end smartphone contributes 43% RF front-end modules SiP assembly market, followed by low-end smartphone (35%) and luxury smartphone (13%). The RF front-end SiP supply chain for 4G is led by a few IDMs like Qorvo, Broadcom (Avago), Skyworks Solutions, and Murata, which outsource part of SiP assembly to OSATs. 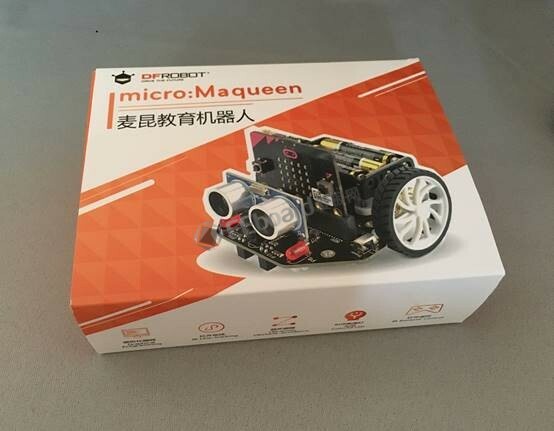 Qualcomm emerged as a serious RF front-end player for 5G solutions, especially 5G mmWave, with multiple wins at various mobile OEMs. And the leading company is expected to maintain its dominance in the future. 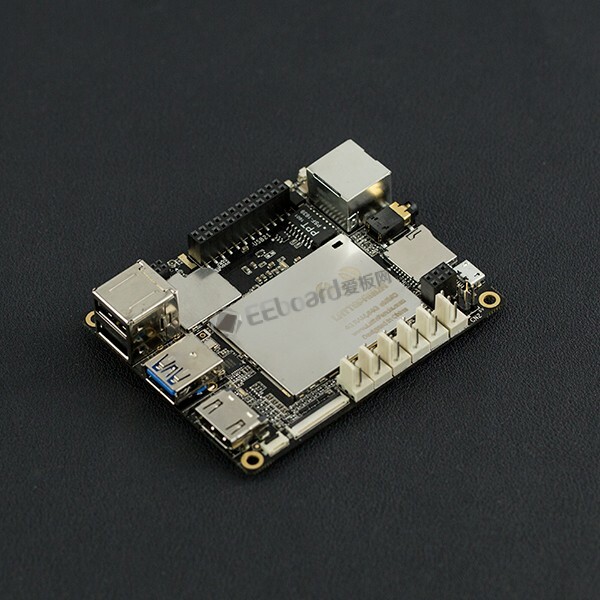 In fact, Qualcomm along with Samsung are the only players that provide complete solutions for 5G, including modem, antenna module, and application processors. Qualcomm, being fabless, outsources all of its SiP assembly, which results in more business opportunities for OSATs. Also, IDMs are focusing more on RF front-end solutions for 5G sub-6Ghz, which also require packaging innovations like the closer placement of components, double-sided mounting, conformal/ compartmental shielding, high accuracy and high-speed SMT, etc. This requires investment in new tools & processes. Yole and System Plus Consulting analysts believe the burden of high investment in assembly technology will motivate firms to outsource more to OSATs. The leading smartphones manufacturer Apple, is also part of the SiP playground. Indeed, for the second year, within its new versions of the iPhone, the Xs, Xs max and Xr models, Apple has decided to adopt innovative RF technologies, with the latest and most advanced filter and packaging technology proposed by Broadcom. “Apple’s front-end module is the first to include a flip-chip GaAs-based power amplifier and advanced electromagnetic (EMI) shielding, allowing frequency band sharing in the same SiP platform”, details Stephane Elisabeth, PhD, Expert Cost Analyst, RF, Sensors and Advanced Packaging at System Plus Consulting. The reverse engineering company, under its RF SiP from Apple, proposes a complete review of the FEM SiP, including a detailed analysis of the matching IC, the filtering dies, the internal and external EMI shielding and the power amplifier. In addition, System Plus Consulting is offering a detailed analysis of the Apple Watch S4 SiP, featuring die analyses, packaging processes and cross-sections. “This chip contains at least four innovative packaging technologies from different OSATs player,” explains Stephane Elisabeth from System Plus Consulting. “In the RF applications, our report features analysis of the conformal/ compartmental shielding from ASE, and the double Side BGA from Amkor.”It also includes a relevant comparison between TSMC’s inFO technology since the A9, a cost estimation of a single side RF FEM SiP and a double-side BGA, as well as a detailed comparison with the non-cellular version of the S4 SiP. Yole and System Plus Consulting will pursue their collaboration to propose smart technology and market analyses all year long. Next month in China, Yole Group of Companies and its partner NCAP China propose a valuable program of conferences during 2 days welcoming the leaders of the semiconductor industry. 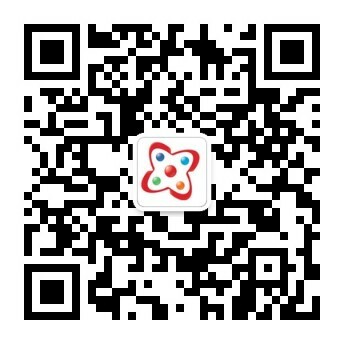 This event Advanced Packaging & System Integration Technology Symposium, will take place in Shanghai, China, on April 22 & 23, prior NEPCON China. With a strong focus on the applications side, including the 5G revolution, Yole, System Plus Consulting, NCAP China and invited speakers including Besi, Kulicke & Soffa, Unisoc and more will share their vision of the industry evolution and analyse the technical challenges.